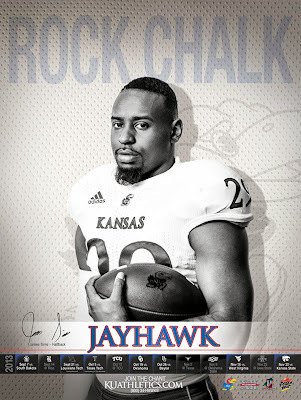 Kansas had won only six games in three seasons and entered last Saturday's opener against South Dakota saddled with an 11-game losing streak. 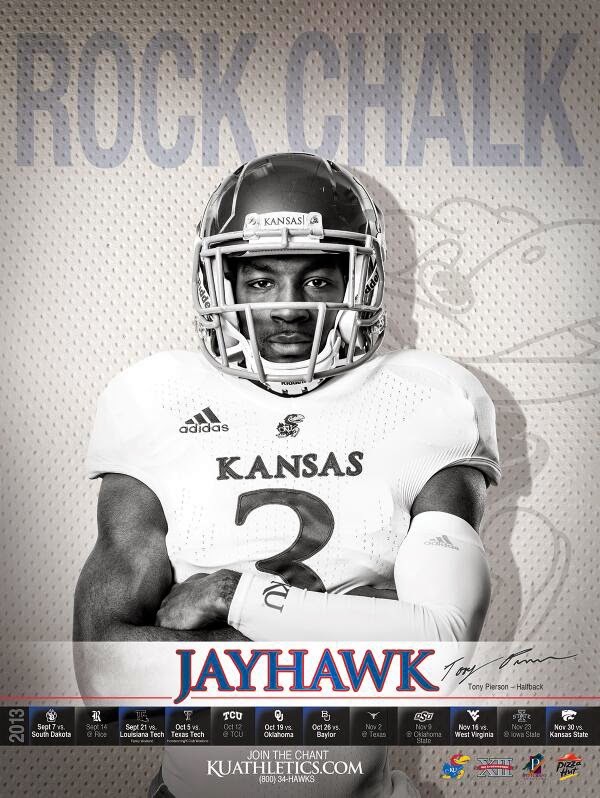 But the Jayhawks are 1-0 to start 2013 after a 31-14 victory over the Coyotes. 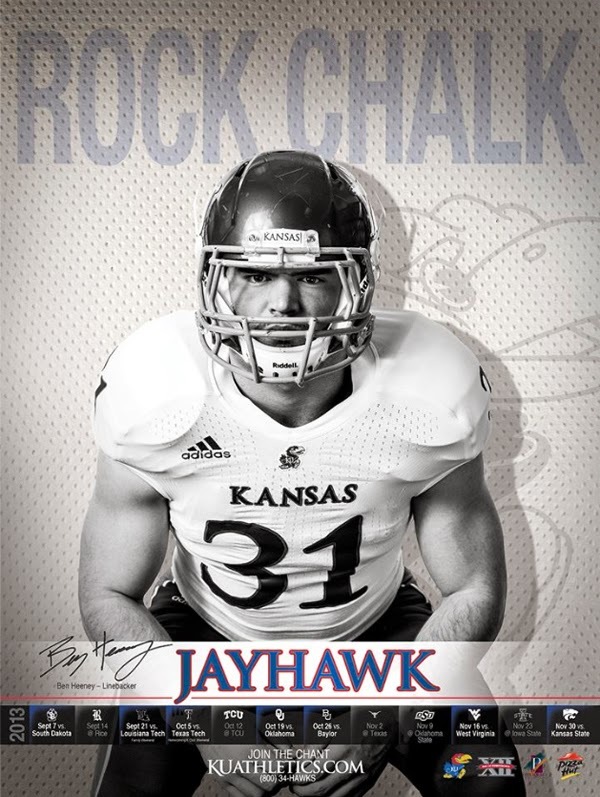 Kansas produced four posters — the team poster (top), followed on down by halfback/flanker Tony Pierson, linebacker Ben Heeney and halfback James Sims. He's back! Charlie Weis hobbles to the lectern and answers questions during the news conference to introduce the 55 year old as Kansas' new coach. Weis let it be known that he's going to end the country club atmosphere that is said to have led to the ouster of Turner Gill after two years. "It's not going to be pleasant around here in the springtime," he said. Weis will be paid a minimum of $2.5 million over five years. 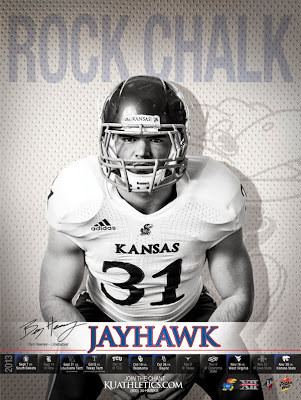 After the jump is video of Weis being introduced Saturday at Kansas' home basketball game against Ohio State. Mark Mangino is rested, relaxed and ready to go. The former Kansas coach was given a field pass to Saturday's game between Kansas State and Miami at Sun Life Stadium. It's the same stadium where Mangino guided the Jayhawks to victory in the 2008 Orange Bowl to complete a 12-win season. Mangino, who lives in Naples, Fla., spent the game on Kansas State's sideline. He was a full-time assistant at the school from 1994-98. Kevin Haskin of the Topeka Capital-Journal caught up with Mangino, who left Kansas in December 2009 after allegations of player abuse. Haskin asked Mangino about how it all went down in Lawrence and drew a smile from the coach, who followed with, "No comment." One thing was clear. Mangino plans on getting back into the business. "I'm just waiting for the right opportunity," he said. Mangino probably looks good right now to Kansas, which has gone 5-10 under new coach Turner Gill.